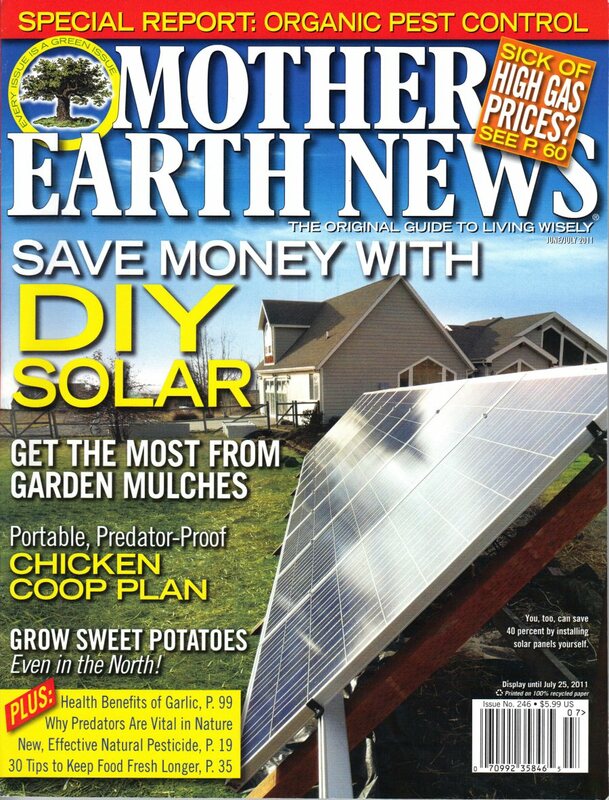 Sorry, I have to crow a little -- our DIY grid-tied PV system is the "Top Story" in the new issue of Mother Earth News, and is on the cover! 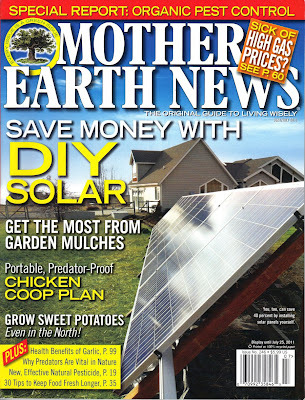 This is the June-July 2011 Mother Earth News and is out on the our local newstands now (May 25). This is the system I put in my back yard last year. Its a grid-tied system and uses the Enphase micro-inverter grid-tie scheme. In this arrangement, each PV module gets its own small (190 watt) grid-tie inverter. These micro-inverters are daisy chained together, and the combined output is carried back to the house as 240 VAC house power. After going through a disconnect switch, the power just hooks up to any free circuit breaker in your regular breaker box. I did all the work on the system myself, and found the whole process pretty straightforward -- even the permitting and utility company people were friendly and helpful. Will anxiously await for my copy to hit my mailbox!